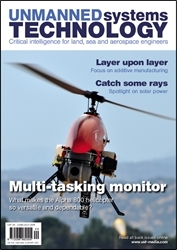 Highlights in this issue include a conversation with UAS CTO Andrea Maccapani and an insight into UGV's. Dossiers on the IXblue DriX and the sky Power hybrid system, as well as a look at the Planck Aero Sherwater. In Operation looks at the Delft Dynamics RH4 and show reports from IDEX 2019 and Oceanology Americas 2019. A digest on the StreetDrone Twizy as well as focus articles covering maintenance and ground control systems. Click 'Details' for more information. 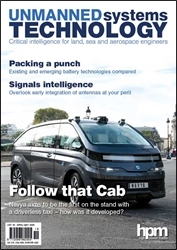 Highlights in this issue include a conversation with Blue Bear's MD Ian Williams-Wynn, the Earthsense TerraSentia in operation as well as an insight into UUV's. Dossier's on Intelligent Energy's fuel cell & the Wingcopter 178 as well as looking at the Stromkind KAT series. Show reports from CES 2019 & Advanced Engineering 2018 as well as focus articles covering 5G & connectors. Click 'Details' for more information. Highlights in this issue include a conversation with Dr Jenny Kingston and an insight into logistics. Dossiers on the Milrem Multiscope and OS Engines GF400U-FI, show reports from InterGeo 18, Commercial UAV Show London 18 and Commercial UAV Expo 18. In Operations looks at the Ultrabeam Hydrographic Ultra 2, we look at the VideoRay Defender as well as focus articles covering wireless charging, IMU's, gyro's and accelerometers. Click 'Details' for full contents. 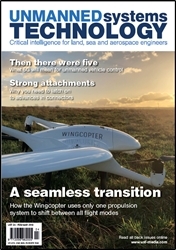 Highlights in this issue include a conversation with DroneUps' CTO John Vernona and UpVision in operation. Dossiers on the XOcean XO-450 and the BMPower fuel cell system, as well as an insight into space systems. We look at The Small Robot Company and the Prismatic HALE UAV. A show report from InterDrone 2018 as well as focus articles covering radar systems and navigation systems. Click 'Details' for full contents. Highlights in this issue include a conversation with UDS co-founder Robert Hannaford, also show reports from Eurosatory 2018 and the AST Symposium. Dossier's on the Robot Aviation FX450 and the Liquid-Piston X-Mini, we also look at Zipline and Riptide Autonomous Solutions. An insight into UAVs as well as focus articles covering imaging sensors and electric motors. Click 'Details' for full contents. Highlights in this issue include a conversation with rFpro's director Chris Hoyle and a look at the GuardBot. Dossiers on the Alpha 800 and Pegasus GE70 as well as an insight into USV's. Show reports from AUVSI Xponential 2018 and CUAV Expo Europe 2018 as well as focus articles covering additive manufacturing and solar power. Click 'Details' for full contents. Highlights in this issue include a conversation with Saif-Deen Akanni the founder of Sentient Blue, an insight in UGV's and we look at the Swiss Aerobotics Hummel. Dossiers on the Navya Autonom Cab and the UAV Factory's UAV28-EFI. Show reports from UMEX 2018 and Oceanology International 2018 as well as focus articles covering battery technology and antenna systems. Click 'Details' for full contents. 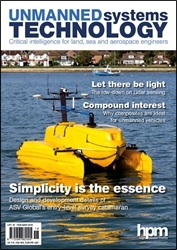 Highlights in this issue include a conversation with Jean-Claude Tourn of E Yo Copter, dossiers on the ASV Global C-Cat 3 USV & the Limbach L 275 EF. A show report from the Consumer Electronic Show 2018 as well as an insight into UUV's. A look at the Heliceo DroneBox as well as foucs articles covering test centres, Lidar & composites. Click 'Details' for full contents.